Donny Larsen studied photography at San Jose State College in route to obtaining his BBA in Business Administration back in the 1970's.After graduation Donny continued his life in music and enjoyed a long successful career doing one of the things he loved most in life. While on tour he never forgot his camera and captured life on the road in places like Paris, London, Zermatt, Athens, Monte Carlo, Madrid, Lisbon, just to name a few. Back home in San Francisco he got the opportunity to photograph his beloved San Francisco 49rs during the glory years of Joe Montana, Dwight Clark, Ronny Lott, Steve Young et al. His mentor in those days was Phil Bray the world class photographer with ties to the movie industry working on films such as Lion King, True Believer, Kite Runner, Hannibal, Mrs. Doubtfire and many more. Donny finally decided to leave the road as a musician in 1994. With the support of his wife Lisa and and the encouragement of her employer, Dave Leathers, (owner of Showcase Publishing) Donny was given the opportunity to expand his art from music to his second love, photography. He has traveled the United States, Europe and Mexico in search of beauty and interesting people to fill his his camera frame. 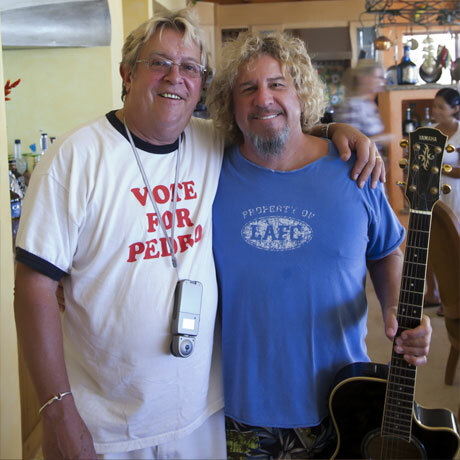 Recently he was sent to the beautiful lands end at Cabo San Lucas, Mexico to photograph the stunning landscape as well as and old friend from his days in music, Sammy Hagar. Here are some of his shots. We will be adding more in the future so stop back from time to time. Thank you for visiting and please do contact us when you are in need of a creative photographer.